As a naturalist who has led thousands of whale and wildlife tours near Victoria, one of the greatest experiences on the water is the opportunity to watch wildlife interact with each other. With such a diverse array of species in the Salish Sea, we constantly witness the vast social dynamics of nature. Off the coast of south Vancouver Island near Victoria, we have two ecotypes of killer whales. 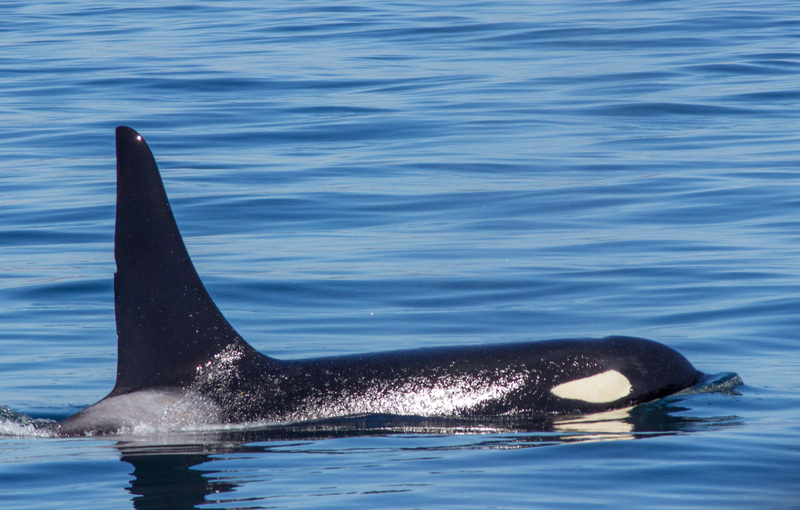 One type only eats mammals and are referred to as Bigg’s or Transient killer whales. They prefer to hunt species like Harbour seals, Harbour, and Dall’s porpoises and California and Steller sea lions. They are also known to prey on dolphins and other whales like Minkes, Humpbacks and Grey whales. 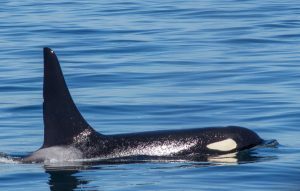 The second type of orca we see are called Southern Residents and they strictly feed on fish and cephalopods, especially Chinook salmon. Many species of marine wildlife have also learned that there are different kinds of killer whales, knowing that one kind is harmless and the other is a dangerous threat. Humpback whales can often be seen in the same areas as both types of orcas. When the fish-eating Residents are in the vicinity, humpbacks are relaxed and calm knowing that they are not a target. On many occasions we have even witnessed humpbacks socializing with Resident killer whales by swimming close to them, often spending time together for extended periods of time. Two humpbacks lunge feeding in Juan de Fuca Strait. When Transient orcas are in the area, humpbacks behave completely different. They spend more time at the surface and we can hear them trumpeting, a sound they make in many different situations, including when they are under stress. If there are several humpbacks in the same area they will group up, always putting any youngsters in between adults to protect them from the Transients. 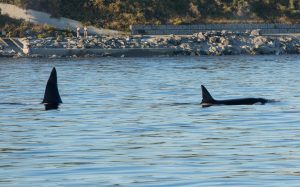 In 2017, a mother and her calf were actually attacked by a large group of Transient orcas locally near Sooke. 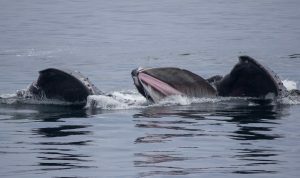 The mother sent out distress calls and soon over a dozen humpbacks appeared from the surrounding area to help defend the mother and her calf from the mammal-hunting orcas. Their valiant gesture was successful- the Transients decided to give up the hunt and move on. Even the less known Minke whales, a small baleen species that also inhabit the Salish Sea, recognize that they are safe from Resident orcas, but need to be wary of the Bigg’s orca population. Minkes are built for speed, fleeing from the Transient killer whales when attacked. But they do show curiosity about the Southern Residents when they come into close quarters. One of our most memorable trips was in 2010 when Southern Resident orcas and Minkes decided to make friends up and down Haro Strait! 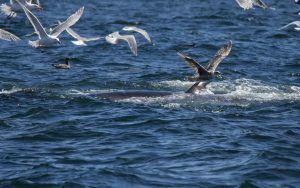 (a) An elusive Minke whale feeds at the surface among hundreds of seagulls. Photo Credit: Rachael Merrett- Marine Naturalist, Orca Spirit Adventures. It was a calm day on the water and J-pod, one of the pods of the Southern Resident population, was foraging along the shoreline of San Juan Island. But as per usual, the population’s oldest and most famous male, Ruffles or J1, was way offshore by himself hunting salmon. Or at least we thought he was alone. We shut off our engines so that we would be quiet and watched as Ruffles’ wavy six-foot fin cut surface when he would take a breath. But then we saw another small, curved fin beside Ruffles- it was a Minke whale! They were swimming so close to each other, they looked like they had to be touching. Then something extraordinary happened- the Minke whale came towards our boat and swam around us three times while Ruffles waited off to one side. After checking out our boat, the Minke whale joined Ruffles again and they headed off together.